Yesterday, as two shiny black coffins passed from Lebanon to Israel, and murderer Samir Kuntar appeared in his "commando" uniform at a festive welcoming ceremony in Lebanon it was hard to accommodate the welter of emotions that flowed during one of Israel's darkest days in recent memory. But, as with every traumatic event here, there are points of such stark illuminating light that always occur among the simple people, not the so-called "leaders," which enable us to retain our pride and faith in the ultimate destiny of the country. Eldad Regev, 28, and Udi Goldwasser , 31, were both "miluimnikim"—reservists who spend around a month every year serving with their army units . When they were abducted they were fulfilling their reservist obligations. Yesterday, as the coffins containing their remains were returned, the members of Eldad and Udi's reserve unit were waiting at a nearby army base. Shlomi, a soft-spoken member of the unit in his mid-thirties, choked back tears as he told reporters that all the men would continue to serve, "with the spirit of Udi and Eldad accompanying us all the way." While accusing Hezbollah of "playing with us" by withholding information about Regev and Goldwasser for two years even till the last moments before the exchange, Shlomi acknowledged that the tears he and his friends could now openly shed would be not only tears of sadness but "tears of memory." At the moment that the coffins were removed from the black vans on the Lebanese side, a rabbi at the Regev home in Kiryat Motzkin quietly lit two memorial candles in the stairwell of the apartment building underneath pictures of the two kidnapped soldiers. Neighbors and friends sobbed as reality finally hit home. Sadly, halachic input has been sorely lacking from the Israeli debate over the lop-sided exchange—not a word was heard from either of Israel's chief rabbis, Yonah Metzger or Shlomo Amar, causing many of us to ask, once again, just why our tax shekels continue to subsidize the anachronistic institution of the chief rabbinate, who are shunned by the ultra-orthodox world and ignored by secular Israelis. A few hours before the exchange took place, I received an e mail notification about the second yahrzeit ceremonies of Benji Hillman z"tl, son of friends in Raanana, who was killed early on in the war at age 26, just three weeks after his wedding, sent to battle in order to redeem Regev and Goldwasser whom we now know were already dead. Most years in mid-July, Jews are in the midst of the Three Weeks that lead up to Tisha B'Av, the day that commemorates the series of disasters that befell the Jewish people on and around this date since the destruction of the Temple. This year being a leap year in the Jewish calendar, we're not into that period yet. 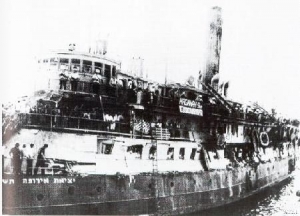 Still, on the secular calendar, this week marks the 61st anniversary of the date when the Exodus, packed with 4500 Holocaust survivors aboard, limped into Haifa harbor after having been boarded by British authorities resulting in the death of three passengers. As the British sought to send the Jews back to France, from where they had set sail, the defiant survivors refused to disembark and started a 24 day hunger strike that eventually led to members of the UN Special Committee on Palestine influencing their colleagues in New York to put the partition plan to a vote. That decision, taken in November 1947, of course, led to the creation of the state of Israel in May 1948. In Jerusalem last night, just hours after we had all witnessed the heart-sickening spectacle at the Lebanese border, a few hundred people gathered to relive the heroism and single-minded Zionism of the Exodus. Yes, it may have been the fictional account –in the form of the 1960 film Exodus starring Paul Newman, but nevertheless, reality seeped in, as it tends to in Jerusalem. In the audience at the auditorium of the Menachem Begin Heritage Center were several passengers from the real Exodus; the daughter of Yossi Harel, the commander of the Exodus who died a few months ago and veteran Jewish journalist, Ruth Gruber, 96, who covered the story in 1947. We gasped as we saw the exact spot where we were sitting depicted in one scene, and murmured as we recognized familiar spots in Jerusalem in their 1960 state. Otto Preminger had apparently spent 13 weeks filming in Israel using 4000 extras for the epic three and a half hour movie. The head of MGM came from Los Angeles to present the Israeli film archive with a newly restored version of the film, which was the one screened last night. Today, Udi and Eldad will be buried in the north at funerals attended by tens of thousands of mourners. They and their dignified families are the heroes of Israel, 2008, along with the 157 Israelis, soldiers and civilians killed in the Second Lebanon War. If only their sacrifice would lead to something as momentous as the founding of the state.